I don’t know why I liked this book. It’s sweet. It’s as far from cynical as one can get. It’s… nice. But the characters aren’t. They are sarcastic. And angry. Super dysfunctional. And really funny. Seven year old Elsa tells this story and she is hilarious. She’s far too smart for her age and finds other seven year olds to be boring and useless. Adults aren’t much better, especially the ones at school. Granny is her savior. Granny doesn’t have time for rules. Spelling is a suggestion. Tormenting her neighbors in the apartment building is a must. Sneaking out with Elsa in the middle of the night to break into the zoo is logical. Within the first few paragraphs, I knew Granny wasn’t long for this world. Sure enough, Elsa overhears a conversation and has to look up lots of information about cancer. 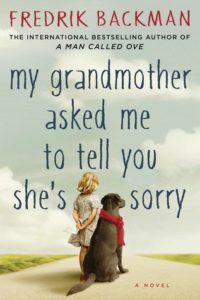 Granny gives her a letter and Elsa is sent on an adventure to tell people she only knows by sight that Granny has asked her to tell them she’s sorry. Elsa learns that a seven year old doesn’t really know much about a grandmother. She wasn’t always a grandmother. She wasn’t a great mother. The woman Elsa got is not the woman Elsa’s mother got, and that’s hard for anyone to process. She learns more about her neighbors and pieces things together from the vivid stories Granny told her from the magical land she created. No one has ever had much of a choice when Granny made a decision, so even now Elsa has to finish her quest and those who knew Granny are forced to participate. There were points where the book made me laugh out loud and more than a few places where I sniffled through. I didn’t understand why Granny was sending Elsa off on this adventure and why she didn’t sort things out on her own before she died, but on the other hand, it’s hard to turn away a dead woman’s apology being delivered by a seven year old. I liked how all the pieces came together and the realistically happy ending. Elsa’s world is much bigger and an apology from the afterlife helped a lot of Granny’s friends move forward. The only part that didn’t work for me were a few moments where I didn’t know if Elsa’s voice was truthful. Not having kids, I don’t know what serious conversations between a seven year old and her mother are like. It mostly felt true, especially when her mother broke down and said she didn’t know how to talk about this stuff. But other times I wasn’t sure how the reality of the story fit through Elsa’s narrative. Another character couldn’t suddenly step in to explain it, so there were a few times I felt like a sentence didn’t quite fit. If you liked Extremely Loud and Incredibly Close by Jonathan Safran Foer, give this one a try. There are some similarities, but Granny does not have the 9/11 backdrop. Unfortunately there is a not a book version of Does The Dog Die. There’s a dog in this book. The dog does not make it to the end of the book. My friends are legally obligated to tell me if an animal in a book gets hurt or dies, so I freely pass this service on to you. Share the post "Don’t Feed Dogs Chocolate, Although That’s Not What The Problem Was"
Does The Dog Die? YES. I’m not upset. Why would you be? Seven year olds are perceptive, and whether they have the language to feel with the stud they are figuring out depends a lot on the seven year old and the adults around them. The books sounds lovely. Thanks for the dog warning. I can generally take it better in a book than I can on screen.